Dr. Christensen decided to further her expertise and to pursue a specialty in orthodontics. In 2010, she completed her residency training in Orthodontics and received her Master’s Degree at Columbia University. In 2011, Dr. Christensen completed her board certification and became a diplomate of the American Board of Orthodontics. Dr. Christensen is the only practicing orthodontist in Greenwich, CT with this diplomate certification. 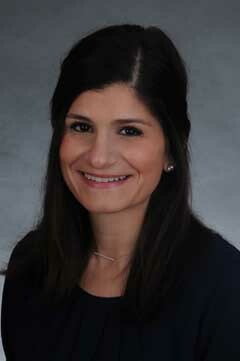 She was also recognized as one of the top Orthodontics by her peers in the Greenwich Magazine for the years 2013 - 2017. Additionally, Dr. Christensen is a member of the prestigious Seattle Study Club, which allows her to work closely with renowned local and national dentist and specialists. Dr. Christensen is an active member of the Greenwich community. She is a member of the Junior League of Greenwich, receiving a Shining Star award in the 2016-17 year for her dedication to the TEF committee. This year, she is proud to be on the Positively Me committee, where she will participate in programs that promote self esteem in young girls- several the age of the patients we treat on a daily basis. Dr. Christensen is also an active family member of the YMCA of Greenwich, where her family has been featured in programming. Dr. Christensen currently resides in Greenwich with her husband, Evan, who she met as her dental classmate at Columbia, and their children, Lila and Todd.